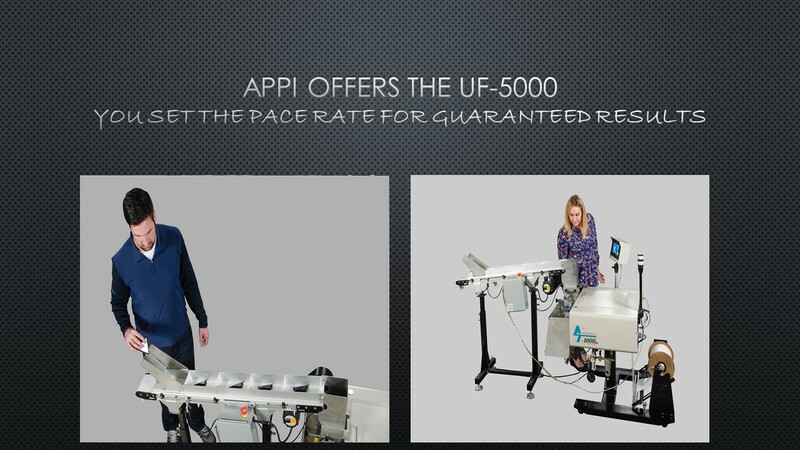 With the UF-5000 you can, set the production speeds for guaranteed packaging results, or set the pace rate for operators. Package faster, easier and safer. You can also feed multiple compartments continually without interruption. No waiting for bags to be blown open or sealed. The UF-5000 allows you to package a wide assortment of parts (kit packages) inexpensively: hardware kits, appliance kits, bike kits, toy assembly kits, and craft kits directly into poly bags, cartons or other containers. "V" Tracking Belt Alignment: Guarantees perfect tracking with no alignment and few tension adjustments. Castors: Rugged castors are standard for plant mobility. 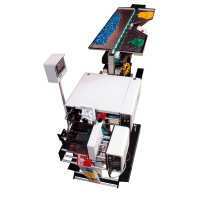 Special Features: Order the conveyor to package your products. Various compartment sizes available. Special accumulating funnels or standard funnels available to achieve proper product flow into a bag or carton. Continuous feed operation (paced rate) with variable speed controls. Automatically indexes compartment signaled by bagger, FFS machine, feeder or carton equipment. Signal sent back to the package equipment after each compartment is indexed or product is detected in compartments. Automatic Feed Operations: Automatically feed product into each compartment with auxiliary vibratory bowl feeders, cartridge feeders, or scales. Special funnels, including accumulating funnels. Various widths, lengths, compartment sizes/cleat heights available. Product sensor to detect product (eliminates wasted bags when compartments are empty). Stainless steel countertops for product sorting and loading. Simply slide product from countertop into compartments.